Trick pot plant containing a large dark pink flower and green foliage, used by Tommy Cooper in his magic act. Cooper (1921-1984) made his reputation by performing conjuring tricks that never quite worked. The exotic bloom in this flower pot is designed to droop when a lever is pressed. Trick pot plant. 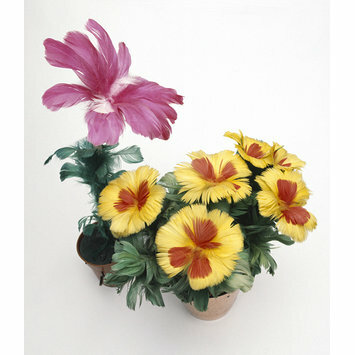 Dark pink drooping flower and green foliage, all made of feathers, in a plastic flower pot, 1970s. The flower droops when a lever in the side of the pot is pressed.